In his briefing to journalists before his Budget Speech, Finance Minister Malusi Gigaba was at pains to point out that the media should look at the Budget holistically and not just focus on a few points such as raising taxes. “We have a positive narrative to tell and that is reflected in the raising of our gross domestic product (GDP) growth projections. 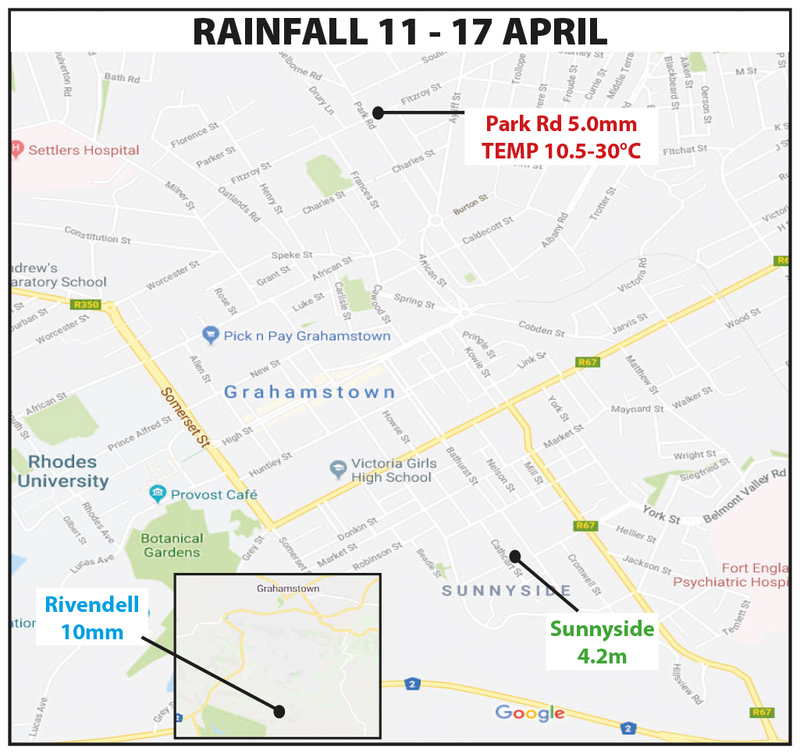 We have taken the tough decisions to put us on a fiscally sustainable path while at the same time undertaking growth enhancing initiatives,” he said. “After several years during which economic growth undershot our projections, we now see the improved growth projections for 2018 and subsequent years as a floor, rather than a ceiling. We are convinced that as business and consumer confidence return, and as government follows through on its commitments to enable growth with prudent, fast and decisive action, we can exceed our growth projections,” he said in his Budget speech. The toughest choice to make was raising the Value-Added Tax (VAT) rate from 14% to 15%, which puts it on a par with neighbouring states. This is the first VAT rate increase since 1993 and the first done by an African National Congress government. It will add R22.9 billion to revenue every year. The other tough choices involved cutting state expenditure, as programmes that were not efficient were cut. 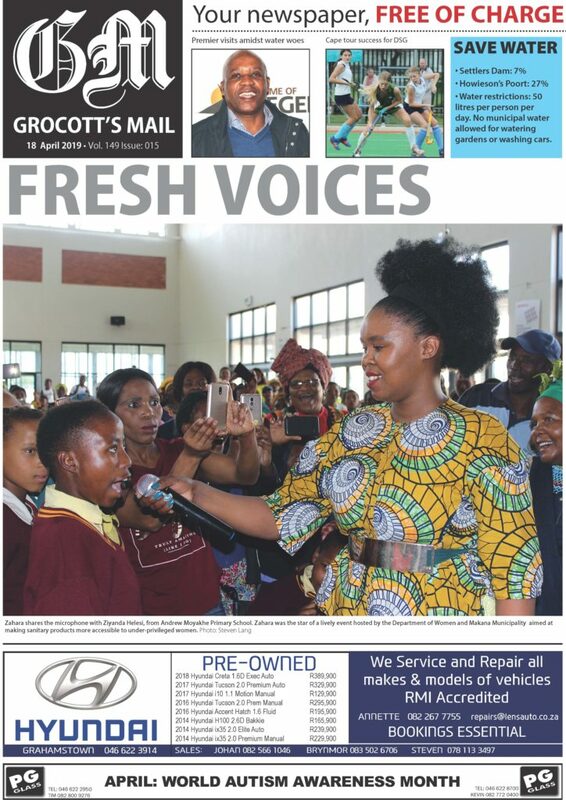 The total saving over the next three years was R85 billion, but these savings were to a certain extent offset by the additional R57 billion needed to provide free tertiary education. 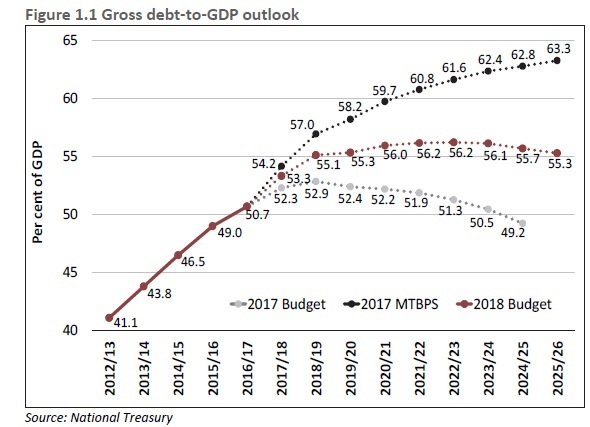 The bottom line is that at the time of the October 2017 MTBPS, gross national debt was projected to breach 60% of GDP in 2021/22, and continue rising thereafter. This Treasury projection reflected major revenue shortfalls, weak economic growth and a limited policy response. It prompted a sell-off in the rand in October and November 2017. The outlook also represented a major departure from the 2017 Budget figures, which previously showed the debt-to-GDP ratio declining from 2018/19 onwards. 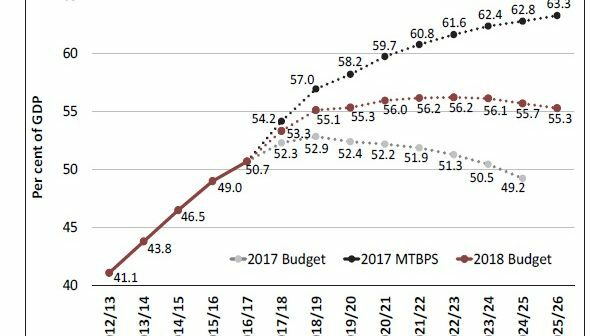 In the 2018 Budget, the combination of higher GDP growth, a narrower deficit, a stronger currency and lower borrowing rates results in an improved debt-to-GDP outlook, with debt stabilising at 56.2% of GDP in 2022/23, but still above the February 2017 Budget projections. 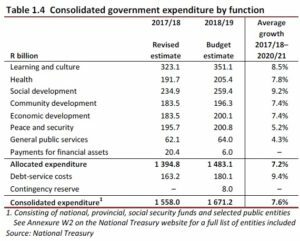 The 2018/19 Budget raises the growth trajectory by an average of 0.4 percentage points compared with the projections given in the October 2017 Medium Term Budget Policy Statement (MTBPS). Although this may not sound like much, for 2016 this margin would have been the difference between positive growth and negative growth as GDP growth in that year was only 0.3%. In other words, Treasury has now added more than 2016’s growth rate to its projections, which will make a significant difference to the citizens of South Africa. The 2017 GDP growth projection has been revised upward to 1.0% compared with the 0.7% expected in October. Growth then increases to 1.5% this year compared with 1.1%. 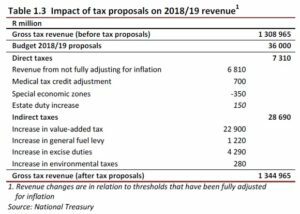 What is more is that because the future is uncertain, Treasury have modelled three scenarios so South African citizens know the range of possibilities. In the first scenario, Moody’s downgrades local-currency debt further, so the impact of that is to lower GDP growth to 0.7% in 2018. In the second scenario, risks in the state-owned company sector result in a fiscal crisis as Treasury has to bailout the sector. In that scenario the economy contracts by 3.1% this year and by a further 0.3% next year and all the growth of the last four years is essentially wiped out with unemployment increasing. That is why reform of the state-owned company sector has such a high priority in government and why it was one of the first things that Cyril Ramaphosa undertook even before he was elected as President on February 15 2018. The third scenario assumes that the increase in business confidence already evident at the beginning of 2018 is maintained and improves further, global growth accelerates by an annual average of 0.5 percentage points, the risk premium on South African government debt is on average 50 basis points lower and bond yields on South African government debt declines by an average of 70 basis points reducing our debt service costs. In such a scenario, which has a high probability of becoming reality, GDP growth accelerates to 2.1% in 2018, 2.9% in 2019 and 3.2% by 2020, as higher income growth promotes stronger consumption and investment demand and a virtuous cycle kicks in leading to sustainable growth as in the 2004 to 2007 period. Higher growth allows the state to undertake robust structural reforms bolstering confidence and investment. One of the structural reforms is to reduce the public service wage bill. For several years, cost-of-living adjustments that consistently exceed consumer price inflation continue to put pressure on departmental ceilings. Over the longer term, government, working with trade unions, needs to develop a comprehensive, fair and sustainable approach to public-service compensation that allows faster economic growth, as the public-service wage bill has crowded out spending in other areas.